An API to improve voter turnout and encourage civic participation. This working prototype was developed by me and my colleagues Andrew Nelson and Shanu Salunke as part of Unlock the Box, a civic hackathon dedicated to expanding voting access and encouraging civic participation. We won the first place in the hackathon and are currently tying up with New Georgia Project’s Director to create the proposed Voting API. Our team worked with the New Georgia Project‘s (NGP) Director Nsé Ufot to see how we could collaborate to improve voting access in the state. We were particularly interested in targeting the Rising American Electorate — people of color, those 18 to 29 years of age, and unmarried women—who comprise 62% of the voting age population in Georgia yet only 53% of registered voters. We identified three areas we could best contribute: a registered voter API, and a social reminder system. Millennial voters are not engaged enough in voting and elections, and NGP is trying to get these people to the ballot box. I first met Nsé at a Code for Atlanta meetup and again at their hackathon. One way of engaging this generation of voters is by helping people access data and develop services and applications. We proposed building a registered voter API on top of the file made available by Georgia’s Secretary of State, as it’s currently only available on a CD mailed to the requester. An API would allow hackathons, coding groups like Code for America, and other developers who want to contribute to civic tech. Polling place data is also difficult to develop with. The Georgia Secretary of State (SoS) only makes this data available through a web form rather than a more developer-friendly database. There is a low turnout and low awareness of elections among the Rising American Electorate. There is also a historical movement to bringing the same level of awareness to the youngest and low-income voters. 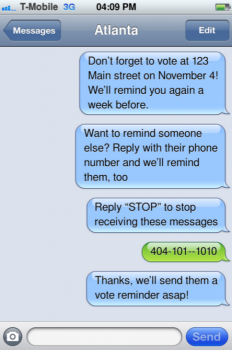 In order to make voting information as accessible as possible, we proposed a social reminder system that automatically sends text messages to the numbers in the voter registration file. We learned, though, that these number go stale rather quickly as people change numbers and phones. So we also suggested that this system also ask voters for the friend’s numbers to both remind them to vote as well as update their voter files.